You might have spotted structural glass on either Grand Designs or in the pages of architectural magazines. It’s a popular material for making stunning glass structures, and is becoming more and more common in the UK as a means to create glazed extensions. Let’s investigate this wonder glass further! Structural glass actually refers to a wide range of products, and is used to describe any glazing that is taking on the bearing of the structural load. This glass can be used for a number of different projects, such as: glass floors, balustrades, and walls. Glass walls are commonly applied by homeowners when it comes to using this material for their extension. That’s because the thick glass is strong enough to go without a framing system, and instead is kept in place by hidden channels and steel angles, all made especially for your home. Giving you uninterrupted views of your surroundings. How much does structural glass cost? As far as extensions go, creating a glazed addition is one of the most expensive projects you can take on. Though that’s not to say you can’t find some budget friendly ways of using structural glass. If you’re not sure how to keep costs from spiralling, talk to your architect in the early design stages. If they also handle building regulations, they’ll understand how your glazing will be priced by suppliers, and how to utilise the glazing to fit your budget. How energy efficient is structural glass? One of the benefits of structural glass is that it doesn’t require a frame, so can be as thick as you like. Thicker glass means you can easily created that much sort after triple glazing, for the ultimate in glass insulation. In fact, structural glass is so thermally efficient, you don’t need to measure it’s U-values, as you have to with other types of glazing. 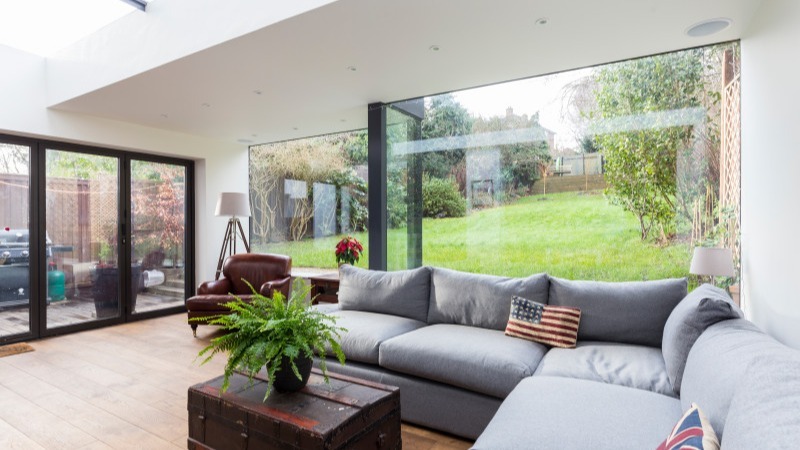 Not all structural glass is created equal, and choosing your specifications is one way of making your glazed extension stand out from the crowd. It’s worth remembering that adding specifications to your glass will cause the price to jump up, but the benefits can sometimes far outweigh this initial cost. Out of all the specifications, this is the biggest to consider, especially if you plan on having a glazed roof or large glass wall. It helps control the solar gain in your extension, preventing your space from overheating on those sunny days. These coatings are completely transparent, and work by reflecting the heat from the sun away from your home. When talking to a supplier of solar control glass, you might hear the term ‘G Factor’ being used. This refers to solar gain, and the higher the reduction, the cooler your home will remain. Laminates can help increase the load bearing properties of your glass, but it is mainly used as a way to change the colour of the material. By inserting a coloured interlayer within the glazing, you can add a playful block of colour to your structure. You can even go so far as to add a logo or image! Technology is a wonderful thing, and has even found a way to benefit the humble glass pane. Heated glass uses electricity to keep your structure warm, melting snow, and eliminating condensation. It can also be used as an added heat source, perfect for high ceiling properties. Before building your glass domain, you’ll need to remember to adhere to building regulations. These are requirements set out by the government, and ensure all homes are safe for occupation. Approval is given by your local building control, and can be obtained by submitting a building regulations package - a set of technical drawings that address the myriad of regulations set out. For your structural glass, building control will mostly be concerned about it’s thermal performance, plus the structural integrity of the extension as a whole. Building regulation packages can be put together by either your architect or structural engineer. At Resi, we help manage this process of your behalf. Not only putting together the technical drawings of your home, but introducing you to vetted professionals in your area who help manage the other areas of your application. Learn more about our building regulations package here. Do you know the cost of glazing?